Action plan: A number of extra-curricular activities, such as Nature school, Green school, Child-Friendly school, Reproductive Health Education, Anti Bullying, and student exchange with SD Karanganyar. Although SD Giwangan was officially appointed as a School Providing Inclusive Education in 2006, it was involved in the national programme as a piloting ‘integrated school’. SD Giwangan first promoted inclusive education and disability through traditional communication such as meetings with parents, other schools or the community. It has now been active in using digital media such as a dedicated school website, and a closed WhatsApp group with parents. Now, SD Giwangan is well-known in Yogyakarta city as an inclusive school. It has also received few national awards as a ‘Green School’. Extra-curricular activities planned as part of the school’s action plan following the MIDRAC Change Laboratory workshops included an ongoing school programme to promote inclusive education and nurture diversity in SD Giwangan. 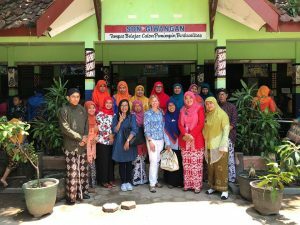 These events include a Nature school, Green school, Child-Friendly school, Reproductive Health Education, Anti Bullying, and student exchange with SD Karanganyar. Although these activities target all students, there is an emphasis on students with disabilities. For example, the anti-bullying activity was implemented by forming a ‘kids liver’ team composed of children with disabilities and their typically developing peers. The biggest challenge in implementing the action plan was uneven awareness and capacity of teachers on inclusion. It was compounded because many parents of children with disabilities rely on educators to support both them and their children. We need to develop greater capacity to support families as a key part of inclusion at school, home and the community. Although most of the action plans targeted children, these activities brought positive impact to the teachers as well. Some of senior teachers, who were quite resistant to inclusion, have now started to support the idea. Similarly, with parents, despite continuous awareness, more is needed. The school realised there is a need to maintain synergy and collaboration with parents in every activity planned for children. Therefore, parents could be involved, and be more aware of how to assist their children at home. Support and coordination with parents is required to achieve better inclusion.